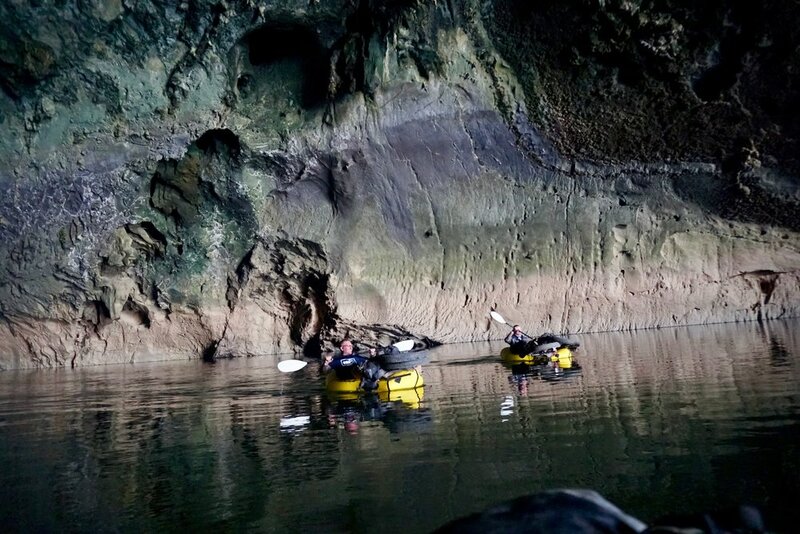 We were looking for a packraft that we could use while exploring The Ho Chi Minh Trails. Started like we all do by watching reviews on youtube. One day we found a tour company in New Zealand offer solely packrafting adventure. We sent them a message and asked what packraft they were using for their business as we looking for a packraft that would sit well on a bike. Their reply surprised us. They said that they started with Alpacka raft but switched all their rafts to new company from the USA and would highly recommend them. The name of the new company was Kokopelli. So, we contacted them and explained what we were looking for. 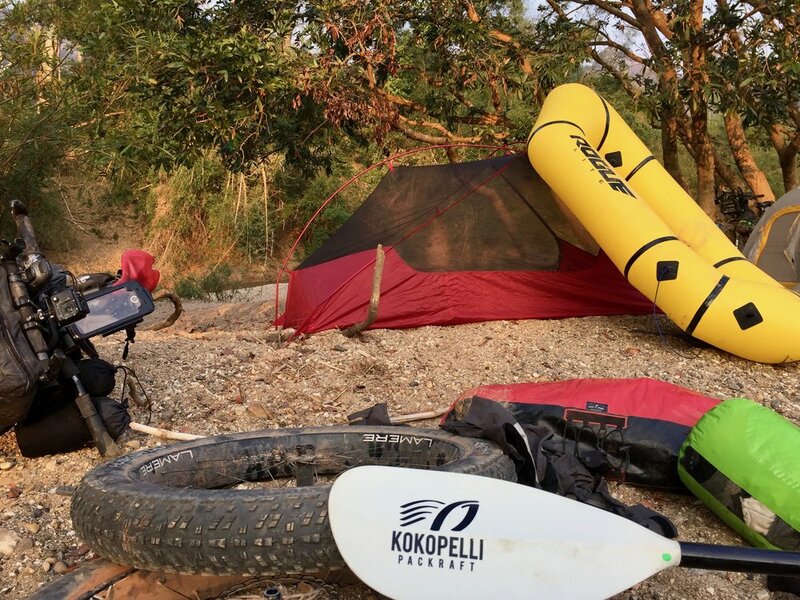 Kokopelli told us that we should wait until beginning of 2018 as they were releasing a new packraft that was designed for what we had in mind. The Rogue Packraft is a lightweight inflatable raft that weighs under 5 pounds and can roll up into the size of a roll of paper towel. Perfect for any ultralight bikepacking adventure. Over the last few months, we got to test the rogue light before their kickstart program was even launched. We were on the trail exploring rivers and caves. So, we got to feel how it handles from river crossing to rapids. What blows us away was how ultralight it was and how compact it could be, yet easily attached to our BarYak. This is a serious must have of kit for any adventurer. 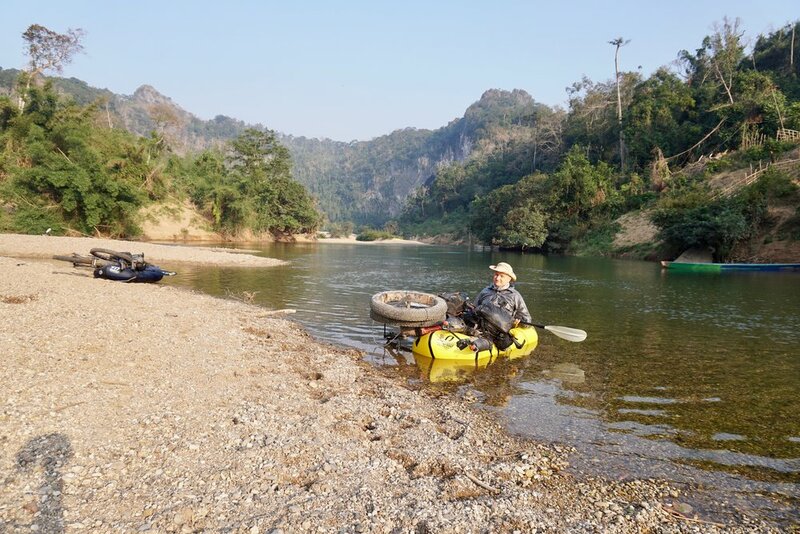 On The Ho Chi Minh Trails each rider will have his own packraft and set of paddle, including repair kit. The Kokopelli Rogue Lite Packraft. The Rogue Lite packraft is an ultra-lightweight inflatable raft that is an exceptional choice for bikepackers seeking a minimalist packraft option. The Rogue Lite has a first-in-class Kevlar reinforced lifted floor which adds durability while keeping the boat lightweight and compact. Whether you're looking for a packraft for lakes, rivers or exploring river caves - the Rogue Lite packraft meets the needs of everyone seeking adventure. The Rogue Lite packraft includes 4 nylon loop d-rings for the convenient tie-down of our bikepack with all gear. The Kokopelli Packraft 4-piece break down paddle is an introductory paddle to get paddlers comfortable paddling on gentle rivers and backcountry lakes. It is made of impact resistant nylon composite blade and fiberglass shaft. The quick release clamp allows paddles to adjust the length and feather angle with ease. This paddle is a great touring and whitewater combo for entry level paddlers. The world of outdoor adventure has long been divided into three types hiking, cycling and water people. Rarely would they combine on one trip. With The Real Ho Chi Minh Trails you be doing all three. Yet it is the only way to complete this Ho Chi Minh Trails tour. Bikepacking through the thick jungle trails or getting off your fatbike to push up one more 30% climbs or crossing impossible rivers. That’s where the packraft adds to the true adventure experience.